The flesh of the semi-freestone variety partially clings to the pit. These peaches are excellent for eating out-of-hand. 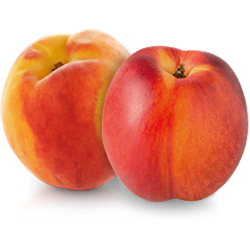 Types of semi-freestone peaches include: Harrow Diamond, Springcrest, Candor, Harrow Dawn, Early Redhaven, Garnet Beauty, Risingstar, Brighton, Sunhaven, Harbelle and Sentinel. The flesh of a freestone peach separates easily from the pit. Perfect for eating fresh and for all your preserving needs. Types of freestone peaches include: Redhaven, Vivid, Harbite, Harson, Blazingstar, Harrowfair, Starfire, Veeglo, Harrow Beauty, Loring, PF24, Allstar, Coralstar, Cresthaven, Redskin, Glowingstar and Harcrest.